"So…. how did you get the idea to write these books?" But never mind; they have their job and I have mine. (Yes, I admit that these interviews give the books visibility, and I appreciate the attention. That’s why I go on answering those six or seven questions with a reasonably convincing appearance of gracious enthusiasm (I’ve seen myself do it several times on video, that’s how I know…). Still, once in awhile you get an interesting interviewer, who makes you think—and that’s a great thing, both for me and the people who read the interview. The NPR interviewers are absolutely wonderful; it’s great fun (both for me and—I hope—the listeners) to work with one of them. But there are quite a few good print journalists, as well, and I thought I might post a few excerpts from some of those interviews here. Feel free to ask your own questions, too <g>—I’ll answer what I can. So—these questions are from a wattpad interview done with Molly Rogers, about five years ago. The complete interview is probably still available on wattpad, but I thought some of the later questions and answers were more interesting (and it’s a looong-ish interview; too long for a good post). 12. Your books require a large amount of research. How did you do that in the beginning when you were just starting out and how is it different now that you are a full-time writer? Do you plan out what research you will need to do for a scene you are writing or do you just write until you need to look something up and then stop and hit the books? Since I generally have no particular idea what’s in a scene until I finish writing it… Well, let’s see. It’s not a very tidy process, let’s put it that way. Speaking just generally, I read several "overview" books or accounts covering the general period (of years) and/or particular events (like battles) that I know will be of relevance. Doing any kind of research is like grabbing the end of a long piece of yarn and pulling— you don’t know what the other end is attached to, and you may end up in convoluted tangles—but you can be sure there’s something there. I find a lot of something. There is logic to it—and sometimes I really am looking for a specific bit of information—but for the most part, the writing and the research are done concurrently; they feed off each other. I may realize that I need to know quite a bit about, say, the Battle of Saratoga, because I know that takes place during the story. So I go and read Richard M. Ketchum’s excellent book, SARATOGA, and in that, learn that Brigadier General Simon Fraser was killed by a sharp-shooter during one of the battles. Plainly, General Fraser must be a relative of Jamie Fraser’s, and this death would be important to him. I learned also the circumstances of the death—that the General died slowly, over the course of a night. So there would be time for Jamie to come to bid him farewell. And I began to see Jamie at the death-bed of Simon Fraser. But I also saw William—Jamie’s illegitimate son—at the other side of the bed. All right, very dramatic. But how might he have come to be there? So I go back to other references, and trace the major events of the life of Simon Fraser—and find a place where William might have become his aide. But coming back to AN ECHO IN THE BONE… I walked the battlefield at Saratoga three times over the years before I wrote the book, and during one conversation with a park ranger, learned that while General Fraser had told his men he wanted to be buried in the Great Redoubt, and many accounts that I’ve seen say that he was— when the Park Service excavated the Great Redoubt, there was no sign of a body. A couple of buttons, but no imprint or other sign that a body had lain there— and the map of the field showed Gen. Fraser’s grave as being near the river. I asked where it was, as I’d like to see it, and the ranger said that in fact, they didn’t know. It wasn’t marked; they just had an account saying that the body had been moved near the river—probably as a temporary measure—but nobody knew exactly what had become of it. "Really?" said I to myself. "Well…. what if….?" Because I knew I needed a way for Jamie to go back to Scotland. He couldn’t just leave the army and go, for no apparent reason. But what if his cousin Simon had asked him to take his body back to Scotland? I knew further from SARATOGA that the negotiations between General Burgoyne and General Gates after the final battle were prolonged and complicated. I also knew that Burgoyne was close to Simon Fraser and saddened by his death. So… what is more reasonable than that General Burgoyne would ask, during these negotiations, that General Gates send Jamie (and his wife, of course) to return Simon Fraser’s body to Scotland? Or that General Gates, tired of the hassle, would want to do this small courtesy for Burgoyne in hopes of easing the negotiations? So there it was; I knew how and why William came to be at the death-bed (and thus to meet Jamie—briefly—face-to-face, but in traumatic circumstances that would prevent his realizing who he was), and how Jamie got to Scotland. Later, I was in Scotland, and decided to see if I could find a suitable spot where Simon Fraser might have been buried. So I went back to the research material and found the general area—Balnain—where his family home had been, and my husband and I went driving, poking around there, just to get an idea of the countryside, so I could describe his funeral. But while doing this, I realized that we were near an ancient tomb called Corriemony, and told my husband I wanted to see it. Anyway—this all started because I could see William and Jamie kneeling on opposite sides of Simon Fraser’s deathbed, Jamie knowing, and William not knowing. This is how books evolve for me; I "see" things, here and there, and I write them, and then many other things gradually come about because of those…. anchors, I suppose you could call them. I do what research I seem to need in the writing of these bits, and then—invariably—find things in the research that stimulate other scenes, either directly or indirectly connected. 13. You’ve said before that your writing style is to write all the scenes and then piece them together in order when you’ve gotten them all done. Do you only do this for novels or does it apply to your short stories and novellas as well? Why is this method so effective for you and do you ever try writing in a straight line just for the fun of it? What fun would that be? <puzzled look> It would take forever to do it that way, since I couldn’t start writing until I’d figured out the entire story, and if I’d done that, it wouldn’t be fun at all to write it. Anyway, yes; I write just about everything piecemeal, including nonfiction articles, book reviews and essays. It’s effective because it works; I’m never held up stewing about What Comes Next— I don’t care what comes next, I just care about something I can see happening. The order of the happening has a logic to it (often, more than one), and that will become clear to me as I work. 14. How do you approach the crafting of your characters and manage to get them to a point where they seem like real people? Is there one of your characters that you consider your favorite and why? What a very peculiar notion of writing—though I do realize it’s a common one. Possibly some people really do that, but I can’t imagine how. Look. It’s not like Legos. You (well, I) don’t start with a crude outline of a character and then start putting little blocks—alcoholic mother, abused as child, has sister he doesn’t get along with, INTJ personality type (whatever that may mean; I do know writers who use psychological personality tests on their characters, which seems truly bizarre—but probably no stranger than the way anybody else does it; whatever works, I mean…)— together according to this plan, to make a three-dimensional golem which you then zap with electricity. An onion is a person whose essence I apprehend immediately, but the more I work with him or her (by "work with," I mean, "write stuff involving them"), the more layers they develop, and the more rounded and pungent they become. Mushrooms are the characters who simply pop up out of nowhere and walk off with any scene they’re in. And Hard Nuts tend to be the people I’m stuck with—rather than the ones who just show up in my head—either for plot reasons (I had a woman pregnant at the end of one book, so when I rejoined her twenty years later, obviously I had a young adult in addition to deal with), or because they were real historical people who were present during an event or period. Them I just hammer on until they break open and reveal something of their inner selves to me. 15. What do you feel are your strengths and weaknesses as a writer? You know how a kaleidoscope works, right? (To save any of your readers having to Google it— essentially, you have a tube with two or three rectangular mirrors in it, oriented at angles, which make multiple symmetric reflections of whatever colored objects you put at the front end of the tube.) Well, imagine that I have a three-mirrored kaleidoscope: one mirror is the historical plane of reflection—the events, the timeline, the cultural/intellectual milieu, the physical settings and constraints. The second is the plane of reflection that concerns the characters—who they are, their motivations, their personal histories. And the third is my own plane of reflection—the background, experiences, perceptions, and personality that make me unique. Hearing about this process does, btw, infuriate people who write linearly. I once had a woman sitting on a panel on writing processes with me inform me that I couldn’t possibly do this, because "you have to have a logical foundation! You can’t put the roof on your building unless you’ve built solid walls to hold it up, can you?" "Of course I can," I replied. "There’s no gravity in the mind, after all. I can make the roof and just leave it hanging there until I have time to build walls under it. You don’t have to write a book from beginning to end, just because that’s how people will read it." She Wasn’t Pleased, but the point here is that people’s minds are wired up differently, and a good deal of writing successfully lies in figuring out how your own mind works best, and using it that way. There is no "right" way to write a book. Anything that lets you get words on the page is the right thing to do. Your comments to my blog posts are welcomed! Click on the "Comments" link. Note that your comment will not appear automatically and immediately, and you may receive a message saying it is “awaiting moderation.” This means that your comment is waiting for me to read and approve it. Depending on my schedule, that may take a few days (or longer). No comments will appear until I have read them. This blog was originally posted on my official Facebook page on March 20, 2016. Excellent! Thank you for revealing some of your process. I have a mixed way or writing. Sometimes scenes pop into my head and I have to write the whole thing out immediately to weave together later-other times a good exchange of dialog between the characters leads to something really cool. However you do it, Diana, I enjoy the end product immensely. Thank you. You are a visionary, truly. I thank ye for it. E’en my wife thanks ye for it. You’ve inspired me to write and pursue writing with diligence and passion no less. Don’t stop writing whilst the passion burns. This was quite interesting. This certainly shows that writers can think ” outside the box”. I can imagine being told that one has to think logically to be a writer! I loved the part of about viewing your characters as onions, mushrooms or hard nuts. Just goes to show that creative people solve problems differently-they just don’t follow rules. 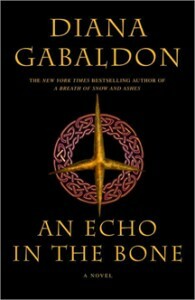 I love this Outlander series! It’s truly a great read. Thank you. This is fascinating to read, as much to get an explanation of how someone else’s mind works (very, very differently from my own, as it happens, which is of course why it’s so fascinating) as to follow your process for writing. I love that you take the time to write it all out so that others can benefit from your observance of your craft. It’s a very generous thing to do. Thank you. Just wanted to say how very much I enjoy and admire your books (and the screen version). You have a marvelous mind and awesome imagination. I love how you write “your way” and pay no mind to others’ opinions. Bravo! I am a baby boomer from North Carolina and I have been amazed how well you captured our manner of speaking, use of strange words or phrases, odd habits and our other unique ways. We have a mixed dialect, indeed. Some of the phrases you have used I have heard my grandparents use many times. Thank you for being who you are and treating us with such wonderful entertainment. God bless! I have tried to start writing a novel and felt it had to be done mostly linearly, and got stumped so i never made it over the hump. I can see exactly what you mean with these different processes, they make so much sense! It gives me inspiration to try again. Thanks for sharing!!! I was so excited to read this interview! My natural writing habit is very like yours, and I have been trying to train myself out of it for the past six years under what I now think may be the mistaken belief that I needed an outline. This outline has become the bane of my existence, and has completely overshadowed the book itself. The outline has replaced the book. I have so many diligent notes that I will never have the time to actually write the material they pertain to and, exactly as you said, once I detailed everything out in the outline, I lost interest in writing them. And then I have the completed scenes, glowing and alive, that I have been told will eventually have to be scrapped when I get down to cases and *really* write (in a linear form). The thing is, I’ve always known this is not true. The characters were already fully formed in my mind when I wrote those scenes. I’ve learned more about them over time, but they are the same people. Over the course of those years, I can think of any number of useful scenes I could have written instead of wasting my time figuring out where those scenes belong in the outline and adding the specifics to my notes on the characters. And then NOT ACTUALLY WRITING. Anyway, thank you so much for writing with such clarity about your process. It was a breath of fresh air!